1. Competing dancers must submit partner names at check-in. Partners must be pre-registered to compete in ballroom dancing, non-competitor parnters have until July 17th, 2020 to pre-register. 2. Dancers may NOT submit partners that are not pre-registered for ballroom dancing. 3. Competitors must fill out dancing entry forms below. Please fill out the appropriate form below and submit to Lisa Vegas at lisavegasproductions@gmail.com​. Solo exhibition routines (Choreographed routine to your music. Bring on CD or thumb drive). Athletes may dance a maximum of two solo exhibition routines. Athletes may compete in all four freestyle divisions. The four divisions are American Rhythm, American Smooth, International Latin, International Ballroom. In order to maximize the opportunity to dance, athletes may compete in their actual age category and one age category lower (excluding Youth – only athletes under 18 may compete in the Youth category). Freestyle events: All events will be finals. If the groups are large enough, the event may be divided into preliminary rounds. Freestyle heats will be danced with all dancers competing in the scheduled style on the floor together for 90 seconds. Athletes will be competing within their registered couple category, experience level and age category, regardless of who else on the floor. The judges will determine the top three athletes for each style and dance, assigning 3 points for first, 2 points for 2nd, and 1 point for 3rd. Athletes will accumulate points for each dance they compete in and medals will be awarded based on total point score in each couple category, experience level and division. The judges will be judging the recipient. Solo Exhibitions: Will be performed based on a predetermined schedule. Competing athletes must bring their own music on a CD or thumb drive and present it to the Music Director at the beginning of the ballroom competition (Athletes are solely responsible for ensuring that their music is on the CD/thumb drive and plays correctly). Solo exhibitions must be under 3 minutes long. Judges will score the solo dances based on 100-point system. Medals will be awarded based on the total points earned by experience level. The judges will be judging the recipient. 1. Pro/Am (A professional and an amateur) and Am/Am (An amateur and an amateur) couples will be judged separately. 2. All judging placements are final..
3. Pro/Am and Am/Am couples can be on the floor at the same time, but will be judged separately. 4. Competitor may not add or change dances day of competition. 5. Male competitors will be given their numbers when they check-in. 6. Ballroom dancing staff will be responsible for queuing competitors prior to the scheduled heat and will direct athletes to the dance floor. Competing couples must follow the instructions of the ballroom staff at all times. 7. 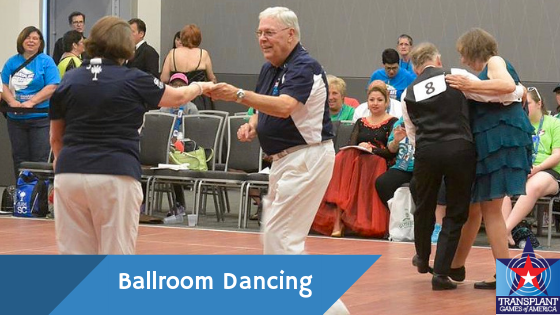 Ballroom dancing staff may combine events/dances based on schedule and number of competitors. This will not the the judging process. Once an event is completed and results are available, ballroom dancing staff must record all competitors and scores to the appropriate system/documents. When electronic scoring is being utilized a manual backup system must be in place to record results.